George Ohsawa, born Nyoichi Sakurazawa (櫻澤 如一), October 18, 1893 – April 23, 1966, was the founder of the macrobiotic diet. 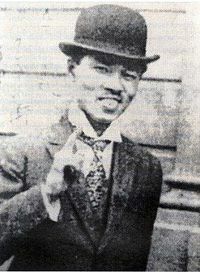 When living in Europe he went by the pen names of Musagendo Sakurazawa, Nyoiti Sakurazawa, and Yukikazu Sakurazawa. He also used the French first name Georges while living in France, and his name is sometimes also given this spelling. He wrote about 300 books in Japanese and 20 in French. He defined health on the basis of seven criteria: lack of fatigue, good appetite, good sleep, good memory, good humour, precision of thought and action, and gratitude. The gradual introduction of sugar into the Japanese diet brought in its wake the beginning of Western diseases. A Japanese midwife, trained in the techniques of Western medicine as a nurse, fell ill and was abandoned as incurable by the Western doctors she had espoused. Three of her children died the same way. The fourth, Nyoiti Sakurazawa, rebelled at the notion of dying of tuberculosis and ulcers in his teens. He took up the study of ancient Oriental medicine which had been officially outlawed in Japan. Sakurazawa was attracted to the unorthodox career of a famous Japanese practitioner, Dr. Sagen Ishizuka. Thousands of patients had been cured by Ishizuka (through traditional use of food) after they had been abandoned as incurable by the new medicine of the West. Ohsawa writes in his books that he cured himself of tuberculosis at the age of 19 by applying the ancient Chinese concept of yin and yang as well as the teachings of Sagen Ishizuka. Later he traveled in Europe and began to spread his philosophy in Paris. It was in this period that he adopted his pen name "Ohsawa", supposedly from the French Oh, ça va, which means "All right" or "I'm doing fine" as a reply to the question "how are you doing?"). After several years, he returned to Japan to start a foundation and gather recruits for his now formalized philosophy. In 1931, he published The Unique Principle explaining the yin and yang order of the universe. After drawing attention during World War II for his pacifist ideals, he wrote a book that predicted Japan's defeat and was incarcerated, narrowly escaping death. After being freed from prison by U.S. General McArthur, he moved his institution to a remote area in the mountains of Yamanashi Prefecture. It is presumed that he got the Western name for his movement from a book written by Christoph Wilhelm Hufeland, a Prussian physician. It is known that Ohsawa spent time in Europe with a descendant of Hufeland. While he was in France Ohsawa wrote a number of books in French, which were published by Vrin Publishers in Paris. Among them were L'Ere Atomique (The Atomic Age), written during the Cuban Missile Crisis. In this book, as in all the books Ohsawa wrote, he devoted considerable space to explaining how macrobiotics can shed light on many social problems as well as the causes of war, and help bring about a world in which war will be seen as an outcome of an error of judgment, and discarded as an effective solution to social conflict. Abdul Karim Kassem, Ngo Dinh Diem, and President Kennedy, all sanpaku and, now, shot to death, all destroyed by the fate of the sanpaku, which is more than coincidence and should be an alarm signal to men and nations, say the Macrobiotics, for thus it has been demonstrated by their leader, George Ohsawa, Japanese prophet of the Unique Principle. This article caught the attention of William Dufty, who, finding relief in the brown rice diet recommended by Ohsawa, became an advocate of macrobiotics, and traveled to Paris to meet with Ohsawa and publisher Felix Morrow. Ohsawa handed Dufty a package, and said, "Here is a lifetime of writing. Do your best with them. It's your turn." In 1965 Morrow's firm, University Books, published Ohsawa's writings under the provocative title You Are All Sanpaku. Ohsawa died of a heart attack at the age of 74. 1931: Le Principe unique de la philosophie et de la science d’Extrême-Orient, Paris : Vrin. 1932: Le livre des fleurs, Paris : Plon. 1952: Le livre du Judo, Tokyo : Sekai Seihu. 1954: The Two Great Indians in Japan, Sri Rash Benhari Bose and Netaji Subhas Chandra Bose, India: Sri K. C. Das. 1956: Jack et Madame Mitie (Deux Erewhoniens dans la Jungle dire "Civilization"), Paris: E.D. 1956 : La Philosophie de la Medecin d’Extreme Orient, Paris : Vrin. 1961 : Zen Macrobiotique, Bruxelles : I.D.M..
1961 : Acupuncture Macrobiotique, Paris : Sesam. T. Nakayama (1934): Acupuncture et médecine chinoise vérifiées au Japon, Paris : Le Francois. ^ Carl Ferré, ed. (1994). Essential Ohsawa: From Food to Health, Happiness to Freedom. Avery Publishing Group. p. 213. ISBN 0-89529-616-0. 1912: Ohsawa re-establishes his health using Sagen Ishizuka's diet of whole brown rice, fresh vegetables, sea salt, and oil. ^ Michio Kushi & Alex Jack (2003) Diet for a Strong Heart: Michio Kushi's Macrobiotic Dietary Guidelines, St. Martin's Griffin.